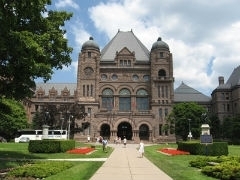 New measures introduced in Ontario’s budget on April 27 are being hailed by RNAO. Drug coverage for every person under the age of 25. Since 2015, RNAO has been calling for a national pharmacare program for all Canadians and has issued several action alerts to political leaders. For more information, please see our submission for a national pharmacare program. Funding for supervised injection services. RNAO has long supported funding for supervised injection services (SIS) as overwhelming evidence proves these critical health services save lives and improve the collective health of our communities. RNAO has already begun working on a best practice guideline for SIS. Funding for offloading devices. RNAO has been advocating for offloading devices, which could prevent amputation for up to 2,000 people with diabetic foot ulcers every year. To read more about this issue, please read the cover story in the July/August 2016 issue of RNJ. Funding for interprofessional and primary care. The province committed $15 million in additional funding for interprofessional teams in primary care, as well as $145 million for primary care health professionals, including nurse practitioners (NP) and registered nurses over three years. For a full list of the measures mentioned in the budget and RNAO’s response, please see our media release.